Last night, President Obama's salmon joke hooked the imagination of the American people. You could see it in NPR's wordcloud, and the tweets and blog posts this morning from commentators far and wide. It's not hard to understand why--salmon are a part of this country's history. They saved the Lewis and Clark expedition from starvation, not once but twice; they are tenacious and strong; they are a central part of the Northwest's culture, spirit, and economy; they provide us with healthy food that makes us smarter; and they bring nutrients from the ocean to feed our ancient forests and western rivers and more than 150 other species in the Pacific Northwest. In short, they represent the very best of this country and define the wildlands of the West. But here's the problem with what the President said last night: he told us, rightly, that in order to move the country toward a better future, we can't have a government that's working in the past. He told us that we need to do things differently, even if doing so is difficult, to achieve a better future. He told us that staying in the past is inefficient and as such is costing us money and good jobs. But this is exactly what the administration is doing right now on salmon restoration efforts in the Northwest. The President's State of the Union salmon joke suggested that the problem with salmon recovery efforts is that there are too many agencies in the kitchen, but the real problem is that the current salmon plan is half-baked. The administration's plan for Columbia and Snake River salmon is based on policies of the past -- Bush administration salmon policies to be exact -- rather than identifying and making the changes necessary to actually restore these iconic creatures. The salmon plan ignores sound salmon science and instead relies on the status quo that is certainly failing. Currently, all runs of salmon on the Snake River are either extinct or listed under the Endangered Species Act. The clock is ticking for these fish. Mired in the status quo, the current salmon plan is inefficient and costs us money and good jobs -- the very pitfalls Obama says he wants to avoid. So, Mr. President, we would say to you what you said to the nation last night: let's try something different on salmon policies in the Northwest -- even if it is difficult. In order to move forward and craft a better future for salmon and salmon dependent communities, we'll need to stop looking to the past. This new path, one that is built upon science, instead of circumventing it, will bring salmon back to the region, feed our families, and help grow a healthy and strong economy. 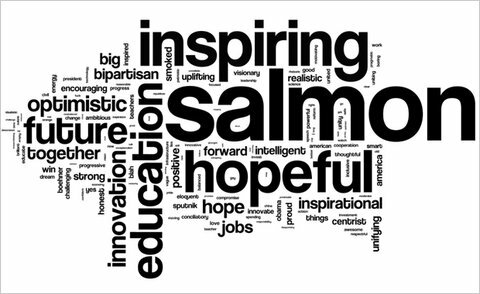 To learn more about what salmon actually need, please visit the Save Our wild Salmon website.